Xiaomi Redmi Note 5 and Redmi Note 5 Pro launched in India which will go on sale today at 12PM on Flipkart, Mi.com and Mi Home. It will be also available in Xiaomi Retail Store later. Xiaomi Redmi Note 5 Pro has a 5.99-inch FHD+ 18:9 Display powered by Qualcomm Snapdragon 636 Processor with three RAM and storage options 4GB RAM, 64GB Storage,6GB RAM, 64GB Storage. On Camera, it has a Dual Rear 12 MP IMX 486 sensor +5MP color sensor to capture depth information, there is also EIS for videos and 20MP front camera.packed with a 4000mAh Battery does not support the Quick charge. Xiaomi Redmi Note 5 is priced at Rs 9999 for 3GB RAM model and Rs 11,999 for 4GB RAM model. 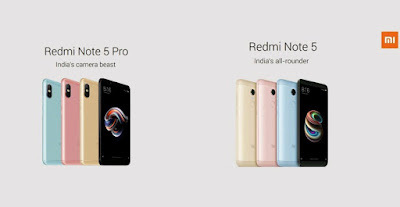 Xiaomi Redmi 5 Pro comes in Gold, Black, Rose Gold and Blue color Priced at Rs 13,999 for 4GB RAM and Rs 16999 for 6GB RAM available on Flipkart, Mi.com and Mi Home from 12PM today.